paperblog writer: Countdown begins to No Holds Bard! Countdown begins to No Holds Bard! So we’re a mere 13 days away from the opening of the No Holds Bard festival, which features my one act play ‘Poor Yorick’ – and panic has begun to set in as we’ve yet to run the play all the way through.. Focusing on Hamlet’s story as seen through the eyes of his court jester who has gone on tour pioneering stand-up comedy, the play is at least getting plenty of laughs from the cast during rehearsals. Clare Drewett plays his bawdy wench girlfriend Bess who specialises in knocking back ale and making rat stew. 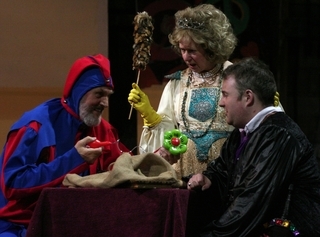 Chris Powell excels as a whinging Hamlet who is fed up of his moaning mother, Gertrude – played to perfection by Sue Morgan in a glittering gown, tiara and Marigold gloves. Bruce Campbell makes a brief appearance as a surprisingly chirpy ghost of Hamlet’s father, offering words of advice such as "Don't drink the wine". We're all really excited that our local newspaper, the South Wales Argus, is sponsoring the festival. Please come along and support us from 15 – 17 March at the Dolman Theatre, Newport. 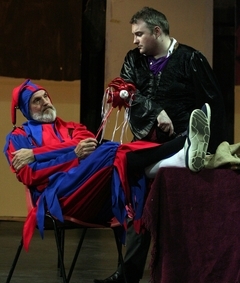 Tickets, which are just £5 and £7, can be booked by phoning the box office on 01633 263670 or visiting www.dolmantheatre.co.uk.